The Los Angeles Kings have joined hockey's immortals, skating the Stanley Cup for a second time. They'll even commemorate the accomplishment with fancy jewelry. Because what symbolizes sacrifice and dedication more than blood diamonds crammed into a glittering gold finger ornament? We live in a corporate world of wanton capitalism and selfish greed. Americans are drowning in debt. Unemployment continues to skyrocket. And while the poor are getting poorer, the rich are getting richer. Disgustingly so. The economic divide in the United States has never been wider. Not sure we need millionaires flashing sparkly trinkets worth more than most third-world economies. Winning a Stanley Cup is testament to one's character, courage, and strength. Victors deserve a championship ring, some tangible reminder of the accomplishment. 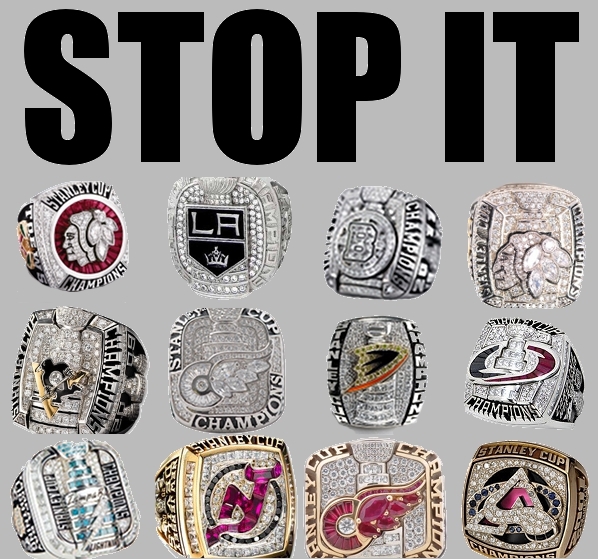 But in recent years, Stanley Cup rings have gone from commemorative keepsakes to garish absurdities, tarnishing sport's most selfless achievement. Time for a new tradition. 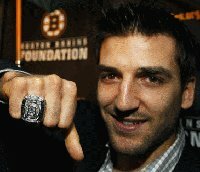 I propose each member of the Stanley Cup champions receives a simple band made from sterling silver, the same material as the original Cup. Engravers will carve the team name and its victory year on the outside of the ring and the owner's name and number on the inside. 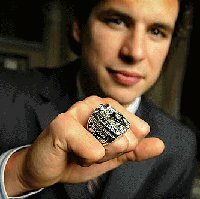 The Chicago Blackhawks spent approximately $13,000 on each of their 2013 championship rings. 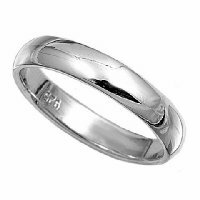 A silver band and engraving would cost less than $1,000. But the NHL teams won't pocket those savings. This new tradition will have a second, more significant component. Along with the engraved silver ring, the winning team will award each player $16,000, or $1,000 for every victory needed to win the Cup. Each player must then give that money to someone else. And ideally, the player will personally deliver the money directly to those in need rather than just cut a check to some faceless charity. That money could bring happiness to a whole lot of people. That money could change lives. This idea, like most great ideas, comes from TV. In the Taxi episode "A Grand Gesture," Jim Ignatowski, a perpetually stoned cab driver who inherits a fortune from his estranged father, catches grief from his friends for being too generous with his newfound riches. Jim defends his generosity and challenges his fellow cabbies to experience what it's like to share money, giving his pals $1,000 each to give to someone else. Everyone learns an important lesson in wealth distribution. That Reverend Jim was a swell fella. Let's benefit from his wisdom. Today I am making the same Ignatowski Challenge to the hockey world. The days of gaudy championship rings must end. Let's start a bold new tradition, one rooted in the same sacrifice and teamwork needed to etch one's name on the Stanley Cup. And it could all start with some benevolent Kings.